Choosing the right fireplace can make or break the mood of your living room. A good fireplace acts as a central focus, drawing the eyes of your guests and giving you a starting place for the decoration for the rest of the room. Done badly, the fireplace can feel out of place in the room, over bearing and can create a negative vibe for you and your guests. 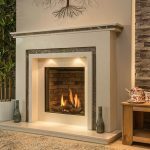 • The width of the wall – choose a fireplace that’s too wide and it will dominate that side of the room, which can be very detrimental in small spaces. On the other hand, an overly small fireplace will not give your room the appropriate gravitas. 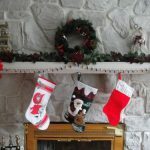 Professional interior decorators recommend a ratio of 1:2 of fireplace to blank wall space. 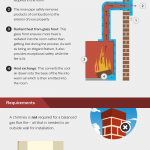 • Chimney access – unless you’re installing a gas fire, you’ll need some sort of external ventilation which is typically provided through a chimney. However, many new builds don’t have the correct ventilation openings so you may need to create a vent to an outside wall which will change the design and layout of the rest of the room. • Colour scheme – fireplaces tend to come in either black or a range of metals, from bronze through to stainless steel. All of these are easy to match in terms of colour, but it’s your surround that will dictate the rest of the room. A simple choice is to go white which will allow you to choose a bright colour for a feature wall. • Modern – modern fireplaces look sleek, with chrome finishes and highly efficient metals to radiate the heat out into the room. They will force you down a more clinical finish for the room as they won’t look like a typical fireplace. • Traditional – these will be the cheapest as they are more common. Whether you choose wood burning, electric or gas, you’ll find models that keep the moving flames at the centre of the design. • Cosy – if you have a smaller room or you’re looking to save money on heating bills, a cosy fireplace will suit you best. They tend to be much smaller and more compact which will allow you to have a smaller surround. • Minimalistic – these tend to be more functional than stylish. 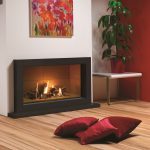 The main aim of a minimalist fireplace is to generate as much heat as possible in the smallest space possible and are often wall mounted to heat the room more efficiently. 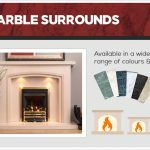 Here at The Fireplace Studio, we are proud to offer our customers a wide range of fireplaces to suit a variety of tastes and interior designs. 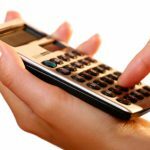 If you would like to know more, please feel free to get in touch with us today. 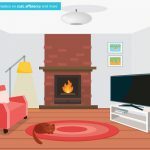 What to Consider When Choosing a Fire? Not sure which fireplace would be best for you? The Fireplace Studio is a registered company in England. © The Fireplace Studio 2019. All Rights Reserved.